We have a particular love for and understanding of the Security Alarm Industry. 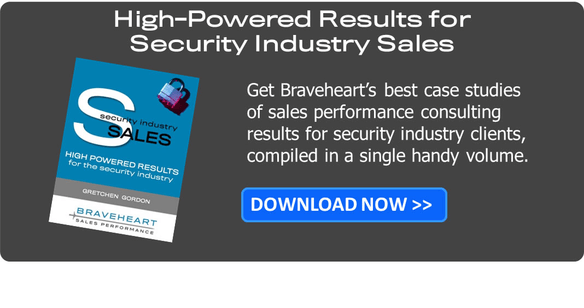 Our founder, Gretchen Gordon, was a longtime lender to the industry prior to founding Braveheart Sales Performance, so has an in-depth understanding of the metrics important to the industry and realizes the essential need for effective sales teams. She also owned a PERS franchise so has a grasp of the important factors impacting success in that niche of the industry as well. Diagnose the issues preventing sales excellence with data-driven precision, before deciding on a course of improvement. This holistic approach will take into consideration each individual as well as your overall sales environment and will calculate how much more revenue your sales team can generate. Having a custom-tailored precise course of action for sales improvement can lower customer creation costs and improve attrition rates. Help your sales team improve their skills forever, to increase your revenue and profitability. Positively impact your attrition rate by treating inside salespeople as true professional salespeople and teach your customer service personnel to effectively deal with moves and cancellations to retain customers and even obtain referrals. With a 95% predictive validity rating, we can help upgrade your sales team through proven recruitment and hiring practices to eliminate the high cost of making poor hiring decisions. Salespeople that perform at a higher level will help reduce customer creation costs and attrition rates. The cost of a poor performing salesperson is reported to be 3x to 5x their annual compensation. Due to the contract nature of the security industry your cost is probably on the high side due to lost opportunities. We work directly with security company operators in a variety of ways to meet the specific need for sales management. Creating repeatable sales processes, measuring KPI’s that are indicative of progress, coaching and training salespeople, as well as other goal setting activities are not always the best use of time for the Business Owner that is managing a salesforce. Let Braveheart leverage our expertise in these areas to help you focus on your highest and best use of time … running your business! -Colby Forrest Director of Sales, Security Associates, Inc.